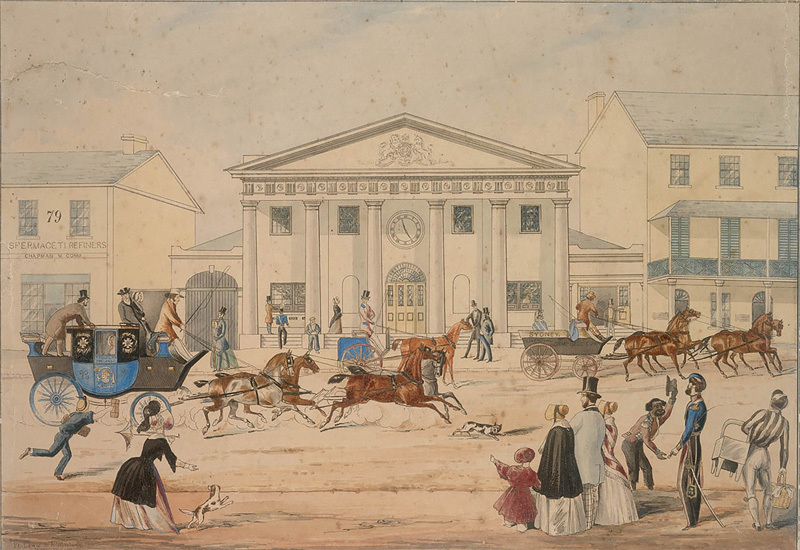 This lively streetscape depicts the mid-morning bustle along George Street, the city of Sydney’s main thoroughfare, in 1846. The view is taken from the western side of the road, looking onto the brand new facade of the General Post Office with it is classical portico, supported by a series of six elegant Doric columns, bearing a crested pediment and the all-important town clock prominently displaying a time of 11.25am. The figures and horses in the foreground of this image were drawn by Edward Winstanley (1820-1849) who was proably taught to paint by his father William. Winstanley had come to Sydney with his family in the Adventure, arriving on 2 May 1833. In October 1834, he joined his father in the partnership of ‘Mr. Winstanley & Son’ as scene-painters at Sydney’s Theatre Royal. By the age of 23, Edward had established a new reputation as a sporting artist. He is best known for his images of racehorses and sporting scenes and was an artistic contributor to the New South Wales Sporting Magazine during the late 1840s. Despite several alterations to the Post Office on George Street, by 1851 the colonial government had established a special Board of Enquiry which concluded that ‘the building [is] very ill-adapted for the business required to be carried out in it…’. By 1863 the situation had worsened such that Mortimer Lewis’s Doric building had been entirely abandoned and a larger temporary wooden structure erected to serve as a temporary post office in Wynyard Square. James Barnet, recently appointed as NSW Colonial Architect, was instructed to prepare plans for a new General Post Office on the Martin Place segment of the present George Street site. The first publication of this image was noted in The Sentinel (Sydney, NSW) on 7 May 1846.